The ATS Foundation Research Program Benefit is our annual fundraising event. 100% of all ticket sales will go directly to support the ATS Foundation Research Program and the cost of your ticket(s) is 100% tax-deductible. The event supports and celebrates the Research Program in promoting the careers of young investigators dedicated to scientific discovery and better patient care. 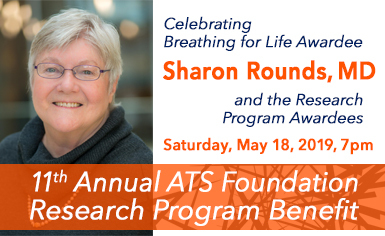 This year, the Foundation is proud to honor Sharon Rounds, MD, with the Breathing for Life Award for her philanthropy, scientific achievement and commitment to the next generation. The reception will take place at the historic Union Station in Downtown Dallas; this new venue will provide open seating to facilitate catching up with friends. Enjoy passed hors d'oeuvres catered by Wolfgang Puck Catering, live music and a relaxed atmosphere for networking or chatting with colleagues. Join the celebration! Register now. For more information on corporate packages, please contact Lara Endreszl at lendreszl@thoracic.org. For more information on non-corporate group or individual ticket packages, please contact Ally Felix at afelix@thoracic.org, or visit foundation.thoracic.org.